When I noticed that last week was so dry in terms of releases, I got the idea of doing “This Year in Panels”, especially since I’ve only covered a fraction of 2009. I suggested the idea to hermanos, who wasn’t a fan because he can’t remember enough of 2009 to come up with a collection of panels. Thanks a lot, pot. Instead, he suggested we do a lovefest gallery for our favorite covers of the year. I’m easy. Let’s do it. Boy, that’s obvious who chose what. Shocking lack of Detective comics up in this piece, and I know I had a few Batman/Tec covers I dug even before the Batwoman launch. @taters: Which ones? Comics.org is the easiest way to link them. But, yeah, the ASM #611 cover was great. The art currently occupies my rotation of wallpapers. The Churchland King City is probably my favorite. 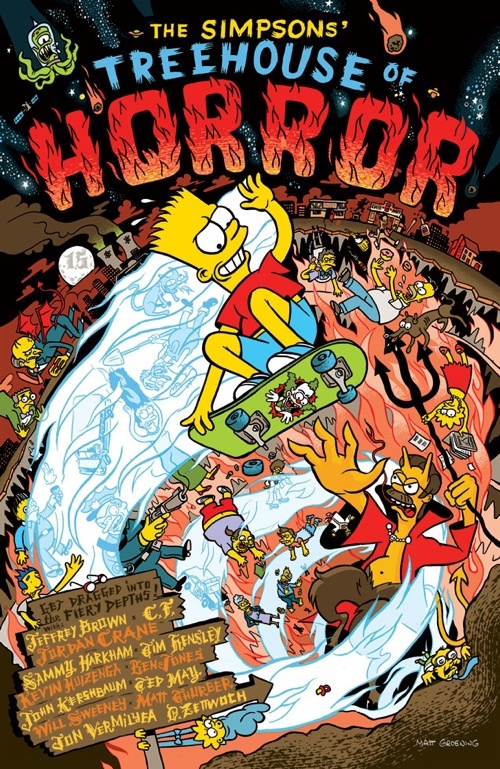 I’d maybe add Treehouse http://laughingsquid.com/wp-content/uploads/bart-simpsons-treehouse-of-horror-20090622-205933.jpg ? HMM I WONDER WHO CHOSE ANTI-VENOM. jk, Gav. I love all y’all. Out of all of these I gotta say the best are any of the Deadpool ones. also as much as I’d love to see Johnson do interior work he’s just such an awesome cover artist, almost all his covers for Unknown Soldier, Punisher, 100 Bullets and Mighty deserve to be collected they’re that good.